Is it possible to order just the Streptavidin component of this kit? I am sorry, but the components found in ab177848 are not separately available. However, we have a very similar reagent sold as a standalone product, Streptavidin HRP (ab7403) https://www.abcam.com/streptavidin-hrp-ab7403.html. It may take a bit of optimization to determine the optimal dilution to use in your ELISA, but I recommend starting at 1:10,000 or 1:15,000 fold dilution. Inquiry: This product arrived at our lab and the vial was stored directly at -20C. Being new to this product I am unsure about how it should be stored. The data sheet tells me to store it at 4C prior to reconstitution and thereafter store it at -20C, but the sheet also mentions that the state of the product is liquid. Would it be best to thaw the vial, aliquot it, and then again store the aliquots at -20C? Please thaw the content in tube and store it at 4C, it will be ok for several months (10-12 months). However if you want to store it for years then please aliquot it into smaller volume and then store it at -20C. Hello, I was wondering whether there is an antibody pair available for the ELISPOT detection of human CCL1/I-309. As far as I can see nothing is sold as such, but has it been tried or is it known whether maybe a sandwich elisa pair works for this purpose? I have confirmed that we do do not have an antibody pair tested for ELISPOT but we do have a pair, ab109788 and ab83413, that have been tested together in sandwich ELISA. Both are rabbit polyclonal antibodies raised against full-length recombinant human I-309, but one is biotinylated, which allows the two rabbit antibodies to be used together in ELISA. Detection is achieved with an avidin or streptavidin enzyme conjugate such as the HRP -conjugated streptavidin ab7403. Efficacy in ELISPOT is assumed to be likely if efficacy in standard sandwich ELISA has been demonstrated, but optimizing the amount of capture antibody and detection antibody will be necessary. There are other pairs that might work but that have not been tested together for ELISA of any kind. For example, the mouse monoclonal ab89446 could be used for capture, followed by detection with a polyclonal antibody raised against full-length protein, such as the rabbit anti-I-309 ab109788 or the goat anti-I-309 ab10377, followed by an anti-rabbit IgG or anti-goat IgG secondary conjugate that has been absorbed/purified to remove reactivity with mouse IgG. Please note that our guarantee only applies to tested applications. I have looked into your case, and as mentioned before, since we recommend storing this product at -20ºC and that it was stored at 4ºC for more than 2 months, we cannot guarantee this product. In addition, this product should be stored in its undiluted form for maximum activity and only diluted prior to use. However, if you would like to re-order ab7403 to make aliquots of the undiluted protein, I could exceptionally give you a 50% discount off this product. If you would like to re-order this product, please let me know by replying to this email. 2. The aliquot that I have been using was at 4ºC for more than two moths and they were working well. 4. The dilutions are made in PBS an then stored at 4ºC for their use. But it doesn’t make sense with the information of the paper that it’s given with the product says that when the aliquots are made they hace to be stored at -20ºC, and the dilutions that I made they were stored at 4ºC and worked well for more than a month. It is normal that the colour that gives the HRP-TMB reaction fades when kept in the diluted form at 4ºC after it has previously been frozen. This is because HRP is an enzyme and if it is frozen in the diluted form, it will loose it's activity and therefore colour. This product must be stored at -20ºC ONLY in it's undiluted form and then kept at 4ºC in the undiluted form also when it is being used in ELISA. You should only dilute this protein prior to immediate use. Undiluted protein will last several weeks at 4ºC but not longer than 2 months and the diluted protein is not stable at 4ºC for any period of time. Since it is stated on the datasheet that this product should be aliquoted and stored at -20ºC upon delivery and makes no guarantees about its stability at 4ºC, the product is therefore not covered by our abpromise guarantee. I am going to look into your case and see if we can give you any discounts on a next order. In order to do this, could let let me know when you placed the original order and who placed it ? I hope this information is helpful to you and I look forward to your response. 1. Was sodium azide added to the aliquots before freezing? 2. Do you always keep your working aliquots at 4ºC for 3 weeks only? 3. Is the problem happening with the original lot of the protein which used to work fine? 4. Are you diluting the protein to the desired concentration and then storing at -20ºC? 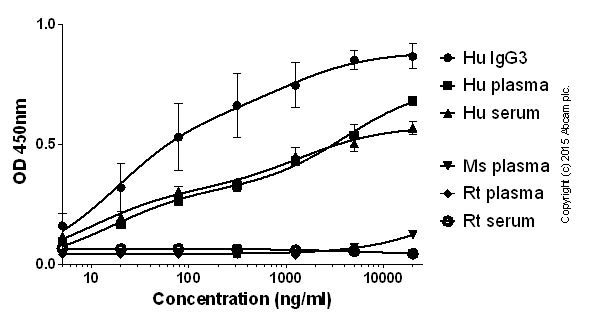 If you are diluting the protein to the desired concentration and then storing at -20ºC or at 4ºC for immediate use then the Streptavidin Peroxidase conjugated will not be stable hence why the colour fades. This product is only stable in the undiluted form for a few weeks at 4° C. You should only dilute this protein prior to immediate use for optimal activity. I hope this information is helpful to you and I look forward to receiving your reply. Besten Dank für Ihre Antwort, hier noch eine Anschlussfrage. Wir sind dabei eine Methode zu entwickeln bei der potentiell folgende abcam Produkte involviert sein können: ab34531, Ab34572, ab34566 und ab7403. Könnten Sie mir bitte eine Einschätzung betreffend der Langzeitverfügbarkeit dieser Produkte zuschicken. Leider kann ich Ihnen nicht garantieren, dass diese Produkte für immer in unserem Katalog bleiben. Diese Entscheidung hängt von vielen Faktoren ab und wird von verschiedenen Abteilungen wie Marketing, Produktion etc. getroffen. Ich kann Ihnen aber versichern, dass im Moment keine Pläne bestehen, diese Produkte aus dem Katalog zu nehmen. Ich schlage vor diese vier Produkte zu testen. Wenn Sie Ihren Anforderungen entsprechen, besteht die Möglichkeit eine größere Menge (Bulk) zu bestellen. Diese kann auch als Lyophilisat geliefert werden und wäre somit für Jahre ohne Qualitätsverlust haltbar. Customer kindly called to inquire about the molarity of this product. We have not determined the molarity of this product. However, 94 kD (94,000 g/mole) would probably be an average MW for the product and the product has a concentration of 1 mg/ml. Therefore an approximate estimation of molarity [Moles/liter = Grams/[(grams/mole) X Liters]is 1.06 x 10-5mol/L.